This is another gem of classic cinema. A film that touched on a controversial subject for its time period. I have often felt this was an underrated and underappreciated film, maybe not in the context of classic cinema, but in the modern movie loving world. Few people talk about this film and I think that is a true shame. It’s a film flawlessly acted, superbly directed. The visual imagery and all around creation of the film through costumes, sets, cinematography and music adds a truly classic appeal of film making, yet with a subject that stepped on toes and expressed a reality not talked about or experienced. The plot to the film is about a New York Detective known as Joe Leland. He is called to the latest murder victim. A man who has been beaten to death. To make matters worse it seems the brutality of the crime stands out for the victim was mutilated, having his private parts removed. Also in the mix is the victim’s sexual orientation. Homosexuality comes into play. Joe tries to maintain a professional approach to the crime, going about trying to solve the ordeal of who murdered the victim, all the while struggling in his personal life with a declining marriage to his wife Karen Leland. Soon Detective Leland has a subject, the victim’s housemate Felix Tesla. Leland goes about getting his confession no matter what, even if it’s false. The plot thickens with unanswered questions, a rush to judgement and another victim. Soon Leland finds himself in an unraveling mystery filled with one twist after the other. This is a Neo Noir style of film. It's very deep and dark for its time period. It touches on subjects very taboo for the time. Homosexuality, is a major subject in the film which played out in a unique mystery, and one Detectives ordeal in that situation. Frank Sinatra is amazing at the part of Leland. Old Blue Eyes was an amazing singer, and even actor. 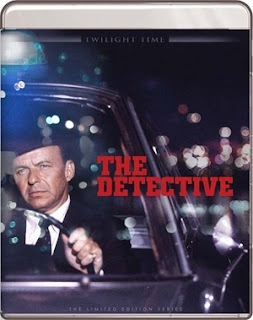 He graced the cinema world with many wonderful examples of film and I feel The Detective is one of those. Also starring the very beautiful actress Lee Remick as Leland’s wife Karen. Remick was a powerful performer. It’s hard to believe she died so young, 55 years old was way too young. She was a goddess of cinema, and her part of Karen is a prime example of her beauty and art form of acting. I will always remember her in the horror classic 1976’s The Omen. The Detective also has a wonderful ensemble cast of perfect performers. The amazing one of a kind Robert Duvall who needs no introduction. He is a prime example of perfection when it comes to acting. From The Godfather 1 and 2, to Apocalypse Now, to the amazing Lonesome Dove Miniseries, and everything else, his career of performances is a vast array of important cinema that few actors can say they have accomplished. Also starring the absolutely breath taking Jacqueline Bisset. She is a stunning, gorgeous, actress with award worthy performances under her belt, and The Detective is no different. I will always remember her next to every definition of acting, and sexiness, Steve McQueen in Bullitt. She graces the screen as if she owns it in the role of Norma MacIver in The Detective. I think what is so sad about watching these older films is how so many of these greats are long gone. So many have passed and it’s a true shame to any lover of cinema to know we will never be able to experience their brilliance again. Ralph Meeker, Jack Klugman, Horace McMahon, Lloyd Wolfe Bochner, William Windom, Anthony Peter “Tony” Musante, Albert Cornelius “Al” Freeman, Jr, Patrick Henry Scarnato, Patrick McVey, Sugar Ray Robinson, George Ames Plimpton, have all left us. Thankfully we have companies like Twilight Time that honors these films with lovely new outlets on Blu-ray of perfected products that stand out. The Detective is a prime example of a high quality product through stunningly restoration in audio and video. The Detective has never looked any better. Directed by one of the coolest directors around, Gordon Douglas. Douglas was a killer at creating memorable pieces of cinema, and The Detective is a prime example of his expertise and craftsmanship of cinema. Sadly, the movie world no longer has this movie genius, he passed in 1993, but thankfully we can return to his vast array of filmed perfection. Douglas directed many greats in so many different styles of cinema, from mystery, drama, sci-fi to everything in-between. From the 1954 sci-fi creature feature classic THEM! to the violent westerns like 1970’s Barquero. From comedy action like 1967’s In Like Flint, to the other two crime films starring Frank Sinatra, 1967’s Tony Rome and 1968’s Lady in Cement. Douglas knew how to create entertainment. The Detective is a prime example of that style that he so greatly owned. The screenplay was written by the amazing Abby Mann. Mann wrote the screenplay for one of my favorite films of all time Judgement at Nuremberg. Which Twilight Time has also released on a special edition Blu-ray which you can read my review for it here: REVIEW. The Detective was adapted from the novel by the same name written by Roderick Thorp. Thorp was an America writer that added imaginative flare to his pieces of work. From action fiction to mystery drama. He was skilled at perfecting a good story, which was his ultimate storytelling genius. His books have been adapted for the screen many times. His novel Nothing Last Forever was the basis for the Die Hard film starring Bruce Willis. One also has to mention the cinematography of the film. Joseph Francis Biroc who might I add was an Academy Award winner. Biroc has worked on many films of perfection, the masterpiece holiday classic 1946’s It’s a Wonderful Life. The amazing 1965’s The Flight of the Phoenix. The stunningly brilliant Hush Hush Sweet Charlotte, the greats Blazing Saddles, The Towering Inferno, The Longest Yard, Hustle, Airplane! and many others. He was a master. That is what stands out about this film The Detective, everyone involved with it was some sort of master film maker in one way or another. The Detective is one of those films, way before it’s time in subject. It’s a film that lingers on your mind long after it’s over. It’s a film that showcases great acting, directing. It’s a film that should be seen and talked about. Twilight Time did an amazing job at picking this film to be released on a special edition blu-ray. Yet again Twilight Time crafted an excellence in Blu-ray form. They did a wonderful example of how to treat a film like they always do. Vibrant in color, dark toned in moments crystal clear. Ear candy in sound. Crisp, clear perfection. Twilight Time never lets you down in this department. They pay respect to the film and share it with the fans. You get the great Isolated Music Track. The man behind the music for this film needs no introduction to cinema fans. The one and only Jerry Goldsmith. Goldsmith has been a part of some of the greatest film scores both small and large. Just to mention a few, The Omen, Alien, Poltergeist, The Secret of NIMH, Gremlins, Hoosiers, Total Recall, Basic Instinct, Rudy, L.A. Confidential, The Mummy, Von Ryan’s Express, The Blue Max, Planet of the Apes, Patton, Tora! Tora! Tora!, Papillon, Chinatown, Logan’s Run, Legend, Alien Nation, The Burbs, many of the Star Trek films. He did so many memorable scores that stand out and are landmarks in film. When Goldsmith died in 2004 the cinema world lost a true master in film making. The music world lost a music genius. Twilight Time honored a passionate master with this special feature. You also get a wonderful commentary by three amazing film historians, David Del Valle, Lem Dobbs and Nick Redman. Always a brilliant listen when three perfected, highly researched film lovers talk about film. Another fantastic blu-ray. Twilight Time has done another fantastic product to represent cinema. The Detective is a film that should be expressed and remembered. With this new blu-ray outlet a modern generation can experience this classic film. Twilight Time brings out some of the best transfers, and restorations of film. Another solid product.